Are there many original ideas? Have you noticed the obsession with originality and the desire to be first to market? Yet most of the innovations that have shaped our world today are based on ideas or technology that were nothing new at the time. For instance, Apple didn’t invent the touch-screen smart phone. IBM created the first smart phone (known as the Simon Personal Communicator), fifteen years before Apple launched the iPhone and the touch-screen was invented as far back as 1965. Apple took existing technology and made it their own through exceptional design and a determination to provide a great user experience. Neither was MacDonald’s the first fast-food chain. It copied the idea from the White Castle restaurant in Wichita, Kansas. 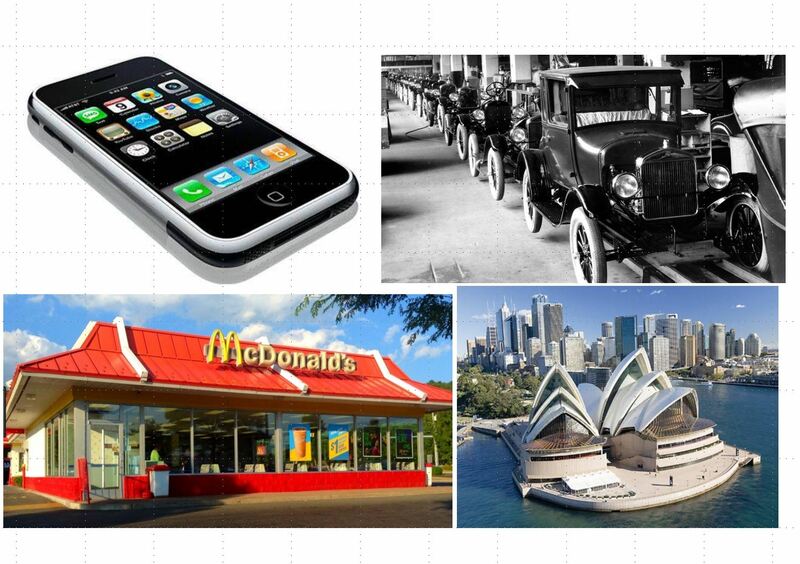 Facebook wasn’t the first social network and Henry Ford didn’t invent the car. So, innovation does not have to be about invention, it’s more likely to be about copying. In his book Copy,Copy,Copy, Mark Earls suggests that copying (but not replicating) of ideas and experiences is something we naturally do and is the most efficient method of innovation. Copying is easy and is a great hack for making fast progress and not looking at problems in isolation. You get to benefit from the mistakes and the success of others that you have never even met. This may explain why being first to market with a new innovation is rarely an advantage. Simply replicating an idea or product and the practice of benchmarking reduces value because it creates increasingly homogenised offers and there is no allowance for context or thought about fixing what’s broken. Indeed, benchmarking damages profitability because of increased price-point competition and less differentiation. 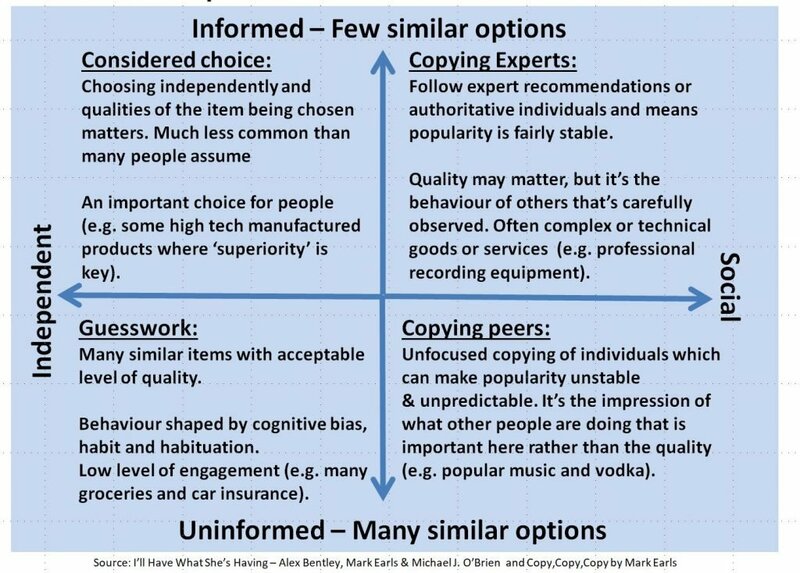 ‘Looser copying’ or from afar (e.g. from a different sector or culture) can add value because it creates variation through the changes or mistakes we make. This is essentially the concept of fixing what’s broken and keeping what works. Why don’t we copy more? In Western cultures we are often led to believe that each problem or challenge is unique and so requires a unique solution. This is almost always misguided because very few problems are new and it gives the impression that it will be extremely difficult to solve. This often results in the rejection of many good ideas simply because of their similarity to solutions used elsewhere. This is partly because of the individualistic culture we have in the West which values originality and discourages copying. This is not the case in China and other parts of Asia where copying is perceived in a much more positive light. The danger is that this attitude towards copying puts Western companies at a disadvantage. Why reinvent the wheel or if it’s not broken, why fix it? Are most innovations the product of a single individual? Nope, it’s a myth that innovations are the creation of a single person. In most cases many people are involved in innovation and they copy from different sources to create something new and exciting. What this suggests is that when done in the right way copying can produce novel and highly effective solutions. Mark points out that because of our brain’s limited processing power we are forced to rely heavily on default heuristics – what did we do last time or what is everyone else doing? We copy ideas and behaviours all the time but often are not even aware of it. Copying allows us to outsource many aspects of cognitive thinking and provides us with a knowledge bank that further reduces the cognitive effort we may need to solve a problem. When we see brand shares following the Pareto 80/20 rule diffusion science tells us that people are not acting independently. Copying makes the most popular brands even more popular than they would be if everyone acted independently. 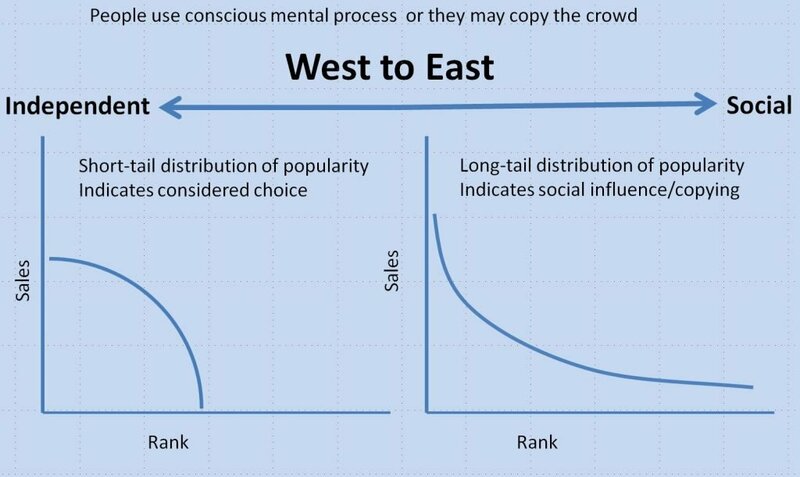 This produces a long-tail distribution of popularity (see right-hand curve) which is a strong indication of social influence and copying. Otherwise you are likely to be looking at independent choice (as shown by the short-tail distribution). The data shows that buyer choices in many markets and services is mainly driven by either directed copying (e.g. following experts or authority figures) or undirected copying (following the most popular variant). Just look at the power of social proof and we can see how important what other people are doing is in influencing sales. In some markets we are now faced with so many choices that it is practically impossible to identify an ideal product or service to meet your needs. Just imagine trying to evaluate every TV or smart phone. In such instances we can either make an educated guess or follow the behaviour of others. By bringing these insights together Mark Earls and his co-authors in I’ll Have What She’s Having created a map of four decision making styles for marketers to use. In his latest book Mark Earls has used this map to create a pattern book of over 50 marketing strategies to encourage marketers to innovate using approaches that have been successful in other sectors. This is a valuable resource as it allows you to focus on execution rather than creating strategies from scratch. Far too many sites are obsessed with what their competitors’ are doing and copy exactly what they see them doing. This results in websites looking almost identical and reduces differentiation. Instead look outside your sector to see what is new and innovative. Copy loosely and then test to see if it adds value before rolling it out on your whole site. Have you noticed how many websites have blindly followed certain design trends? Whether it’s over-sized hero images, auto-play video backgrounds, auto-sliders, flat design, parallax scrolling or the hamburger button on mobile designs. Online experiments have shown all of these trends damage conversion and sometimes frustrate and annoy visitors. Instead of simply replicating new trends, why not consider what prompted the trend and the truths it embodies. You can then copy the elements or ideas that appear to be most beneficial and test them on your site to measure what impact they have on visitor behaviour. This way you can maintain your site’s unique character and still benefit from new developments or trends. I recently participated in a 5 day Google design sprint to develop a new online brand’s proposition and website. We spent a lot of time looking outside the sector of interest to get inspiration. We copied the elements of the market that we thought worked, but wanted to fix what was broken. We achieved this through taking ideas from many different fields and rapid iteration of designs. Within the 5 days we created and tested a prototype design and helped give the project the momentum it needed. The whole agile process is based upon copying as otherwise it would require too much time and effort to make progress. Assess which quadrant of the decision style map your market is most likely to sit in. You can then focus on the marketing strategies that are most likely to align with this decision style. As part of this process it also useful to identify other markets that have the same decision style to your own. This will allow you investigate how they apply appropriate marketing strategies and you may find novel ideas that you can incorporate in your own strategies. It is possible that your market could fall between two quadrants and if this is the case it is worth to considering strategies from more than one quadrant. For example a decision about the preferred method of delivery of a service (e.g. offline or online) might be in the North West quadrant (i.e. 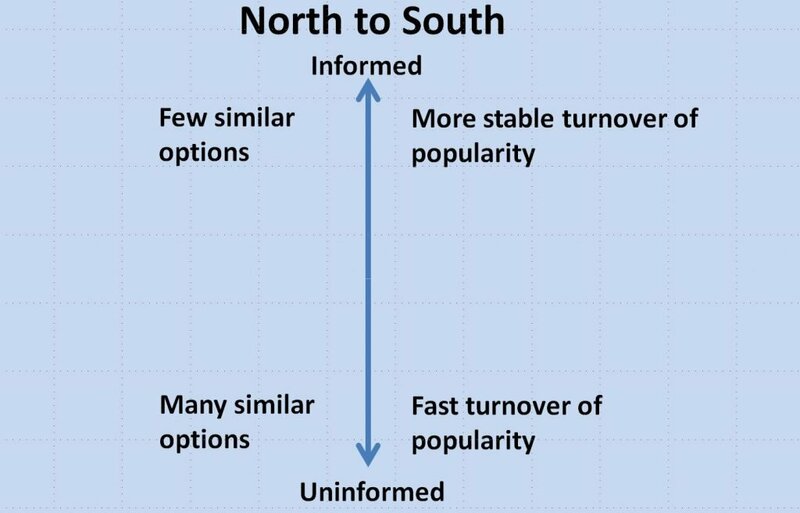 considered choice), but the brand choice may be in the North East quadrant (i.e. copy experts). Originality is overrated as most things are similar to something that already exists. This means copying allows us to benefit from other peoples’ mistakes and create novel solutions to difficult problems. However, just replicating what we see elsewhere can reduce value and lead to a lack of differentiation. For marketers copying is often an important market dynamic that can heavily influence a customer’s decision style. Understanding the most common decision style in your market helps us identify appropriate marketing strategies to apply. Copying relevant marketing strategies from other sectors or cultures allows us to concentrate on the execution and learn from how others to create novel solutions. For more details about how to copy effectively and how to use the decision styles map to execute relevant marketing strategies please get Copy,Copy,Copy by Mark Earls.